It's totally worth heating up your kitchen. I know right? I think I dedicated a whole blog post to it way back in my early blogging days. Great now I want a cookie. So, When I saw that the recipe used smart balance or some sort of margarine I kind of laughed. I went through about a million chocolate chip cookie recipes trying to find the PERFECT one that me and my husband liked. I seriously make cookies every three to four days trying! I'm one of those people who goes crazy if I can't get a recipe right. Anyway, we ended up finding THE recipe and it turned out to be my sisters. It uses REAL butter and turns out perfect. So I'm really skeptical to try a new one. But my question is : Are they flat and chewy or cake-like? Because we love flat and chewy and it was hard to find! I've heard the difference is butter vs Margarine. Leslie-Hi, I don't know you but I sure know these cookies. I'm like you most of the time: a butter purist but you HAVE to try these cookies. 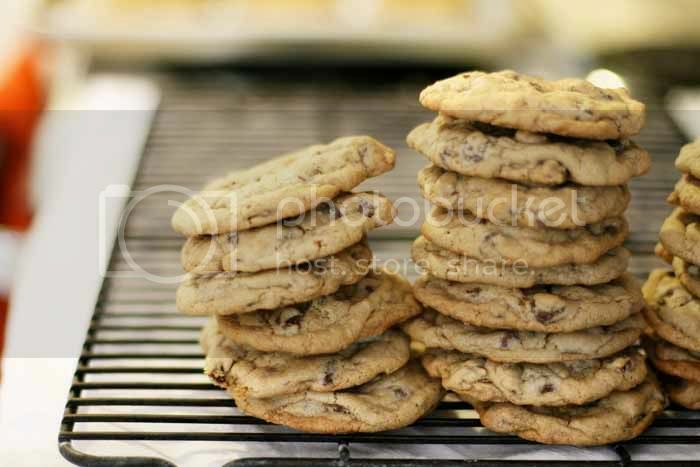 The crunchiness and chewiness of the cookies all depend on the amount of flour you are using. For us, because we live at a lower altitude I only use 2.5 cups of flour. And don't get me wrong I love regular cookies that use all butter but these cookies have a less "greasy" taste to them. If that makes any sense. I suddenly have a craving for chocolate chip cookies!! Thanks! I'll be baking soon! It has to do with the flour? Really? I seriously tried EVERYTHING, even adding less flour... Maybe I will give them a try. Will Canola Harvest margarine work or do I have to use this specific kind? I have never tried these cookies with any other kind of margarine other than Smart Balance so I can't help you on that one! And when I say it has a lot to do with the flour I meant along with altitude. So if you live in Arizona like Hayley then add LESS flour. Like 2.5 cups only. Also when you first take the cookies out of the oven, slam the pan down on the counter to make the cookies "Settle." Lead the way, Hay! "Fallon Salad" is still one of my fave recipes.